Don't miss this opportunity to own a gorgeous vintage Victor which has been meticulously restored, cleaned and adjusted. The original Victor brass-bell horn has been polished and smoothed, and still has its original decal and paint. Amazingly, the paint is still shiny after over 100 years. 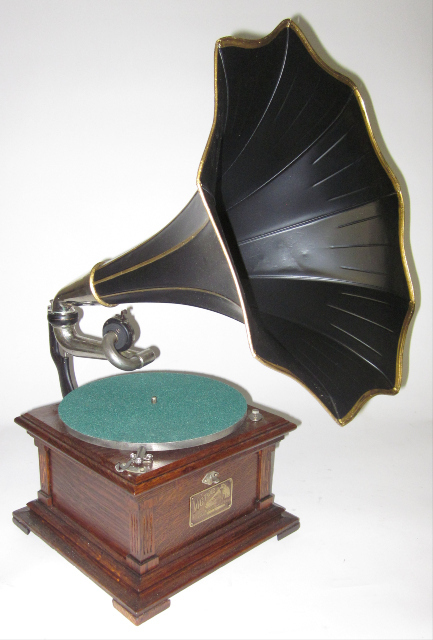 No matter from whom or from where you buy a Victor, you can not find a finer instrument than we offer at phonophan. In fact, we spend a good part of each day undoing the mistakes of other dealers! Shiny paint after more than a century. 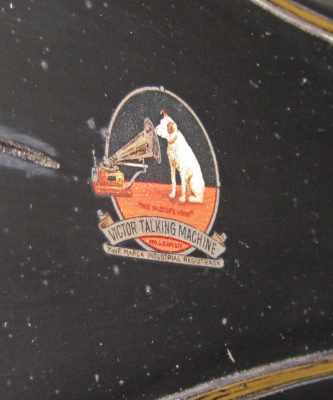 Crisp, bright "His Master's Voice" decal -- at one point, the most recognized trademark in the world. All components clean and well maintained. Quarter-sawn oak cabinet with ID plate featuring the famous dog logo. 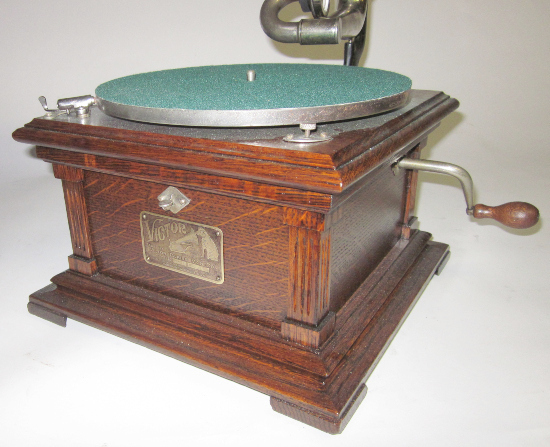 The reliable Victor spring motor will run any 78 rpm record. 78s are plentiful and can be found in every locality, but if you need some to start you off, we are happy to include some with the instrument. A brand new mainspring assures plenty of power. The motor is spotless and bright. Compare this to the cruddy junk offered on eBay. PLEASE NOTE the little blue label at the top left. In 48 years, this is the very first time we have ever seen a dealer label such as this affixed inside the cabinet of a Victor. One frequently desires to know where these ancient instruments came from originally -- well, here is proof of this machine's provenance. It began in a music store in the great city of St. Louis. The original back bracket sports some of its factory gold filigree. The soundbox (needlehead) has been expertly rebuilt to produce sweet music. 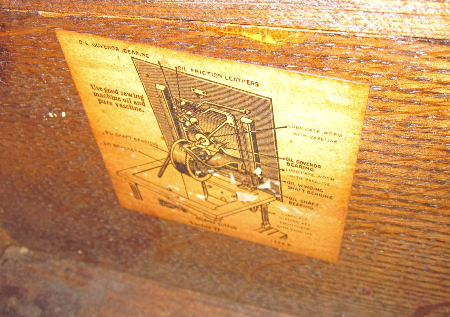 The soundbox is where the awkward restorations of other dealers often fail -- they do not have the skill to regulate and adjust the soundbox -- they don't have an "ear" for music, and this crucial factor dooms them forever to produce inferior work. 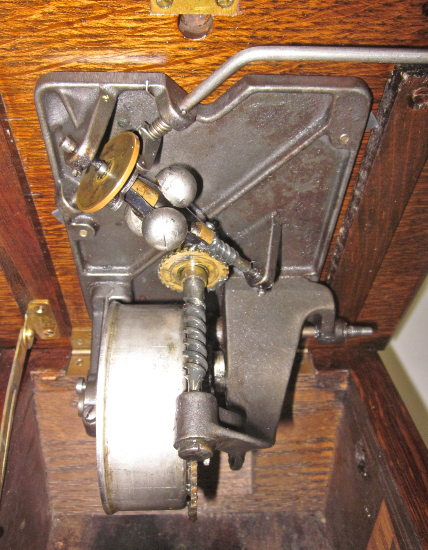 Furthermore, the motor is equally vulnerable to the ineptitude of amateur repairers. It is important to understand how to correctly regulate these ancient instruments, and phonophan has the 48 years of experience to do the job right. The Victor II is a delightful blast of musical mirth from the past! 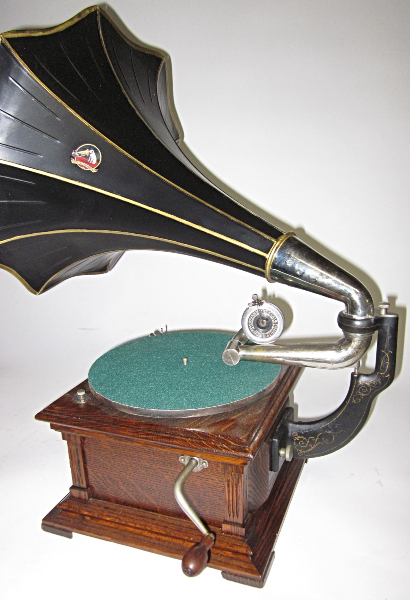 From phonophan you always buy with confidence -- no text copied and pasted directly from other Web sites, no vague or inaccurate descriptions, no silly personal observations lacking historical merit. Consumers are wise to take with at least a pound of salt what they read online nowadays -- but remember, at phonophan we literally "wrote the book!" Price: $1750.00 US, plus s/h (NY State residents must pay tax, if applicable).